Through many years of experience Drummond and Lindah Robinson have identified 7 practical life-changing keys that contribute towards the success and enrichment of marriages when applied on a daily basis. They also noticed that if any one of these secrets are omitted from a marriage relationship even for a short period of time, the marriage will be subjected to immense strain, which often results in total breakdown. This course is designed to give you 7 powerful keys that will restore love, harmony and passion in your marriage. Marriage is an adventure, a journey of exploration – full of surprises and excitement. You can have the marriage you dreamed of. Perhaps you have had disappointments, hurts, betrayal or just a relationship that has slipped slowly into a state of mediocrity, complacency and lack of joy and peace. Every ingredient needed to bake a cake is important, leave one out and the cake will flop. Every part of a car engine is vital for it to operate efficiently. If one part breaks, the whole car comes to a standstill. They may seem obvious when you see them but don’t be tempted to leave even one out or you will miss the path to marriage bliss. Many marriages have broken down and ended in divorce by just leaving out one of these keys. So what are these key ingredients that can change your life and marriage? These keys are expounded in each of the presentations you will now see in this course. Each session comes with a beautiful, full colour manual that you can use to follow the sessions. At the end of every session there are discussion points and guides for personal reflection. Thousands of marriages have been touched and transformed as we have shared these keys around the world. 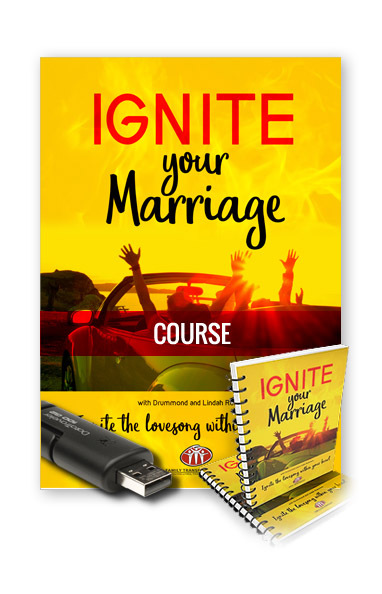 Now in our new latest update called IGNITE, we have expounded on these keys and principles to make them even more relevant and powerful for marriages. Mercy – This first key will stop that cycle of PAIN-BLAME-SHAME, and bring new life. Atmosphere – we discuss how important it is to have a warm inviting atmosphere in our homes. Time – Let us see how we can build our intimacy by spending more fun time together. Communication – None is so rich or mighty that he can get along without it. Honour – Without honour, you have nothing to build upon. Energy – It just takes a small spark to start a mighty flame. It has helped us become more aware of areas in our life we can work on together, particularly the element of time. Easy to maintain focus with brief DVD’s and discussions. Very powerful Course. Learnt a lot and the discussion times were very fruitful. Definitely a lifestyle and not just a Course. It was a really great Course! A phenomenal eye opener and reminder of things one already knows, yet needs to be reminded of again. An AWESOME Course, brief, but punchy, comprehensive and informative, to the point, straight forward with no beating around the bush. I believe this Course will encourage us, challenge us and help us grow, build, nourish, and strengthen our marriage to honour each other and ultimately Honour God. To be the best we, can be for each other and a good example for our son and hopefully the Kingdom. It was a really great Course! A phenomenal eye opener and reminder of things one already knows, yet needs to be reminded of again. An AWESOME Course, brief, but punchy, comprehensive and informative, to the point, straight forward with no beating around the bush. I believe this Course will encourage us, challenge us and help us grow, build, nourish, and strengthen our marriage to honour each other and ultimately Honour God. To be the best we, can be for each other and a good example for our son and hopefully the Kingdom. This Course has given us the guidelines we need to build our marriage according to God’s Word. It has supplied us with the tools to find our flame again. Very informative. Will work through the Manual and put it into practice. The Course highlighted things we need to change, gave us guidance on how to say no to people. Be more loving and spend more time with the Lord. Excellent Course. Very refreshing. Gave us vision how to improve on our relationship / marriage… eye opener : GRACE and TRUTHS. In order to present the course in your church, a leadership couple or preferably two from your church needs to be appointed to oversee and run your marriage program.Marriage is in such a crisis that as churches we need to dedicate time, resources and finance to make a difference in your community and town. To achieve that, we recommend that IGNITE marriage course should be presented on a regular basis, that is, about 6-8 times per year. This will radically reduce your one to one counselling time commitment and result in strong marriages in your church and community. The manual and presentation of IGNITE is very self explanatory but leaders need to prepare by going through the videos themselves to gain the heart and content of the course and style of ministry. At the end of each session we have included sections for personal refection and points for group discussion. Allow time for this at the end of each video. Firstly, for the group of no more than 3 or 4 couples about 15 minutes and then for the couple by themselves for about 10 minutes. The leaders should then move around the groups and be available should any of the couples be struggling during their discussion time. The focus should not be on what has been wrong in the marriage but what changes can they make using the 7 principles from the sessions. Encourage them that applying these principles diligently on a daily basis will totally transform their marriage. Please contact us for more information regarding preparation and presentation. Projects to do at home. The more you discuss and apply at home, the more you will get out of this journey.